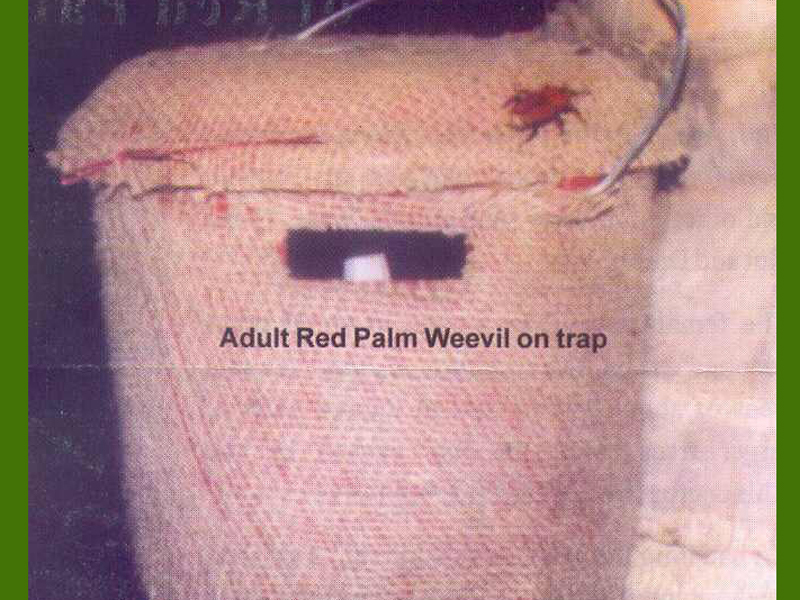 The weevil is attracted to trees by the smell of the palm juice which flows as a result of wounds caused to the soft parts. 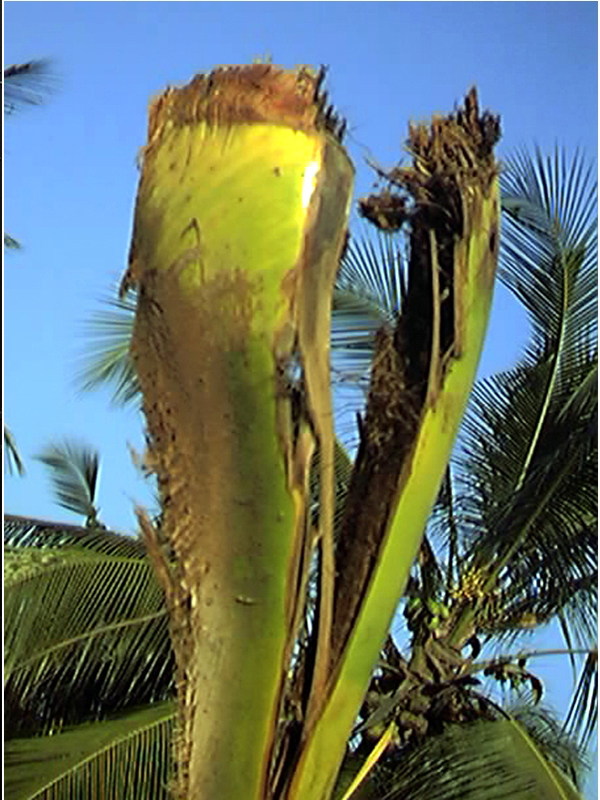 The trees which are tapped for toddy are more subject to the attack by the weevil. 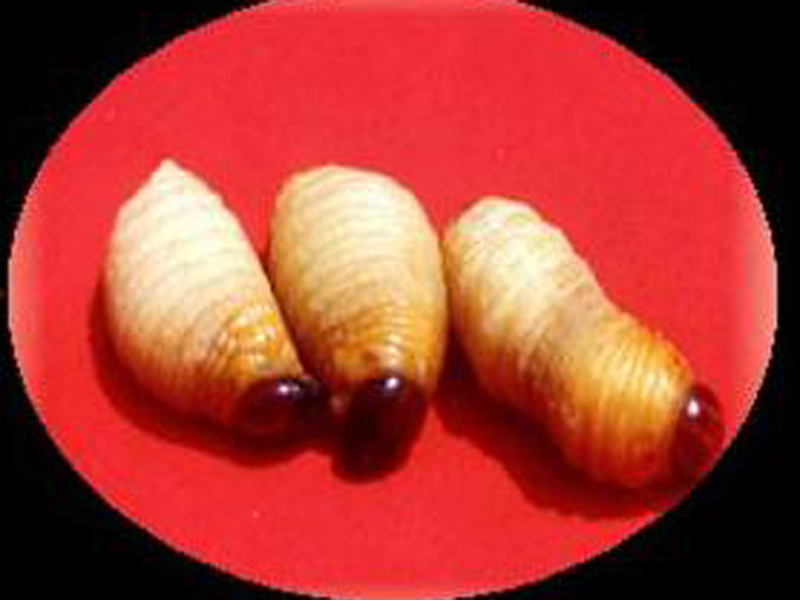 The grub is the damaging stage of the insect.It feeds within the stem tissues in large numbers making tunnels. There are three types of infestation. 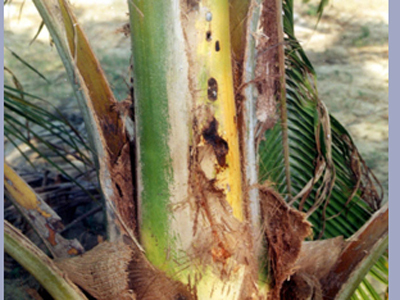 Infestation of the crown helped by the injuries in the crown by Rhinoceros beetle, bud rot or leaf rot diseases. The grub hatching out of the eggs laid on the crown enter direct in to the growing points of the crown. 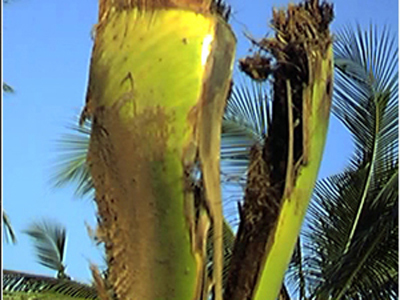 Another type of damage is in the stem and the third in the bole. 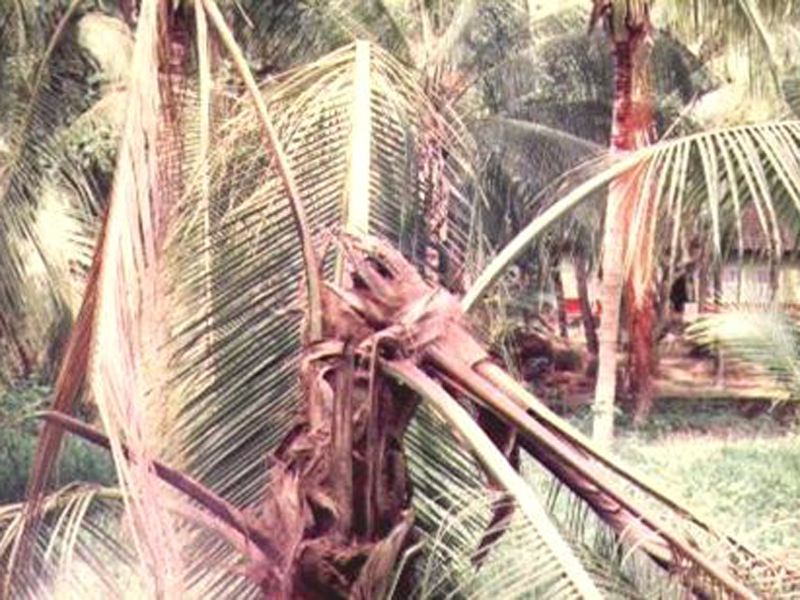 The coconut planted in reclaimed paddy fields are subjected to bole infestations more because the beetle finds easy way for egg laying by entering through the split at the basal region of the tree. Extent of damage in young plantations of 5-20 years is generally on the higher side. The symptoms of the pest infestation usually become clear only at an advanced stage when the crown topples.But certain indications of the attack can be detected early if observed closely for the symptoms. They are yellowing and wilting of leaves of the inner and middle whorls, presence of small circular holes on the stem with brownish viscous fluid oozing out, easy coming off of leaves when pulled, longitudinal splitting of the leaf bases, emission of an odour from the damaged portion of the crown and presence of cocoons or chewed up fibers in the leaf axils or at the base of the palms. Look for the typical symptoms from 20 trees selected at random from a field and work out the number of trees showing damage. Ensure field sanitation.All badly infested trees should be cut and removed and burned to kill the different stages of insects. Avoid making steps or any other injury on the tree trunk to reduce the foci of infection. 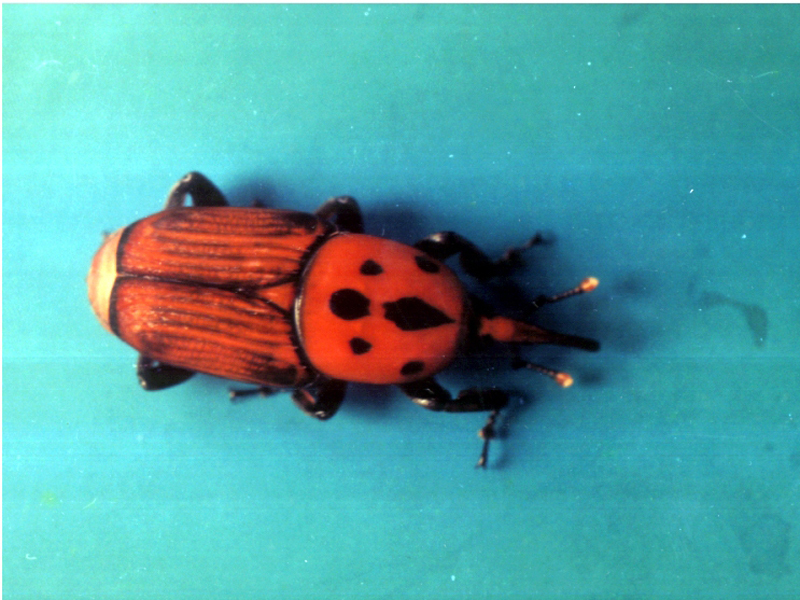 Leaf axil filling as suggested under rhinoceros beetle are also useful against red palm weevil. 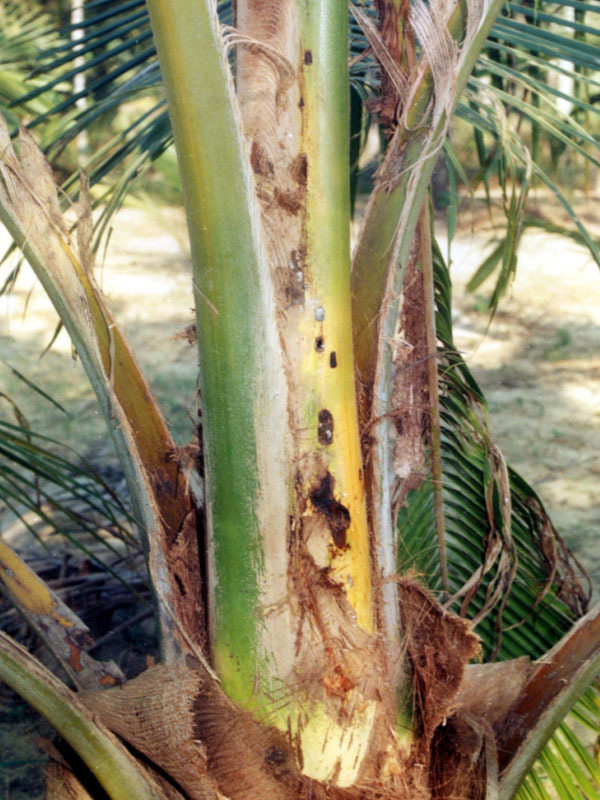 When green leaves are cut from the palms stumps of not less than 120 cm may be left on trees in order to prevent successful inward movement of grubs through the cut end to the crown or stem. In infested palms, observe for bore holes and seal them except the top most one. Through the top most hole, pour 1 % carbaryl 50 WP or trichlorphon 0.15 % using a funnel. When pest infestation is through the crown, clean the crown and slowly pour the insecticide suspension. When the infestation is through the bole, inject the insecticidal suspension through the bole. For this funnel may be tied to the tree trunk at convenient height and insecticide suspension directed to the hole in the bole through a rubber tube which is tightly fixed to the tail end of the funnel. One end of the rubber tube is inserted in to the hole in the bole. Coconut log traps with fermenting toddy or pineapple or sugarcane activated with yeast or molasses can be set in coconut plantations to attract and trap the free floating population of red palm weevil. The traps should be set away from coconut gardens preferably in an isolated place.